We welcomed Burt and Pete into our membership this week. Glad to have these gentlemen join us. Our speaker, Bob Ufer, explained the new technology being used by law enforcement and eventually the general public. This is a sensor vest worn with the body armour. The sensor is activated when the vest is hit by a bullet or a stabbing. The sensor sends at text message with the officer's location, heart rate, location of the wound and if the officer changes location. Truly amazing! It is called a Personal Emergency Transmitter. James recognized some our sponsors for the Taste of Punta Gorda. James received the People of Action Award! The 2019 Taste of Punta Gorda is one for the books! First place restaurant winner...Hurricane Charley's and Deans! The event was outstanding with close to 3700 folks enjoying the food, music and absolutely amazing weather! Chair, James Williams with the asssitance of his wife Penelope made sure the 100 volunteers were in the right place throughout the event! Our special thanks to Iron Chef Sponsor, Publix for their amazing support. Along with Sysco, we appreciated the hard work of the 30 restaurants and 85 vendors who participated. Our First place restaurant was Hurricane Charley's and Deans! Check out the website www.tasteofpuntagorda.org for the 2020! The planning starts now! We are very pleased to recognize David Riley as our new Honorary Rotarian. David has been the key advisor/ influencer for the HS Interact Club and its success! Thank you David and welcome back to Rotary! Our meeting held February 28th welcomed Charlotte Techincal Center director, Deelyn Bennet. We are proud to support our vocational programs and the students who attend. Thank you! Service Above Self in Hondouras, City of Punta Gorda and Paul Harris Fellow! The Punta Gorda Rotary continues to amaze! Congratulations to Charles Marsee received his pin as a Paul Harris Fellow. We welcomed our Student of the Month, Marcus Callahan, Our presentation this week was City Manager Howard Kunik. He updated everyone on the what is happenng in PG! Sound barrier for Gilchrist Park pickle ball courts, reverse osmosis water system is about complete, and the charrette meetings that will happen starting on March 11. Reminder to all that Taste of Punta Gorda is March 3, tickets are $5.00 and children under 12 are free. Tshirts and tickets may be picked up at the meeting next week. 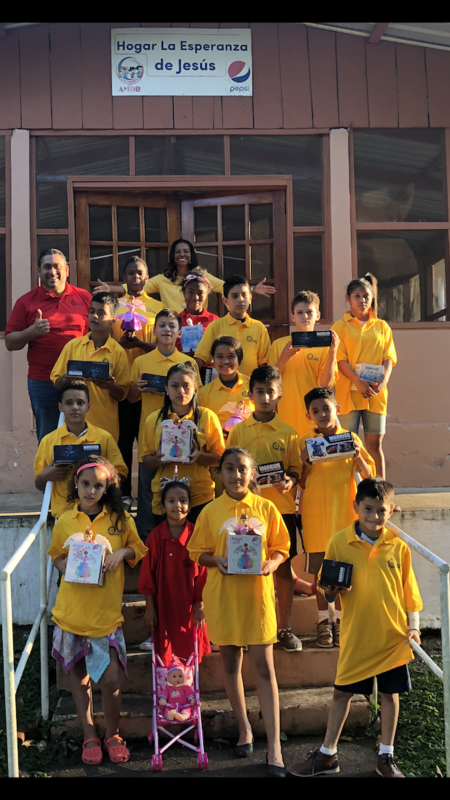 A very special Thanks to our PG Rotary Education Foundation for supportimg the orphange in Hondouras. Thank you Rosa for orgnaizing! We had the distinct honor of having Sandra Hemstead, Rotary District Governor, join our first meeting of the new year. Sandra shared her passion for Rotary and hoped to instill or renew each member's passion as well. She discussed clean water initiatives, feeding the hungry and encourage members to attend the international conference in Hamburg, Germany. 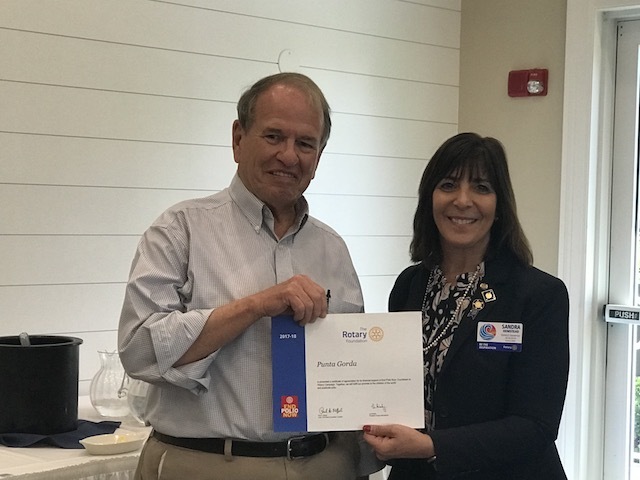 Sandra presented our Club President, Brad Gamblin, with a certificate of appreciation for our clubs financial support of the End Polio Campaign. Thank you! Three months I’ve been in Italy!!! How crazy is that?? I’m starting to get into the swing of things here; a routine if you will. But even with my routine, there’s always a surprise around the corner, something new and beautiful for me to discover or do, and it’s truly wonderful. Fabio, is so funny (not as funny as my real dad, don’t worry) He is great and will help me with anything. My host sister is awesome!! She was an exchange student 3 years ago and went to South Africa. Now she is studying abroad in the Netherlands for college. she came to visit about 2 weeks ago. She and I talked so much, she really opened my mind to new ideas and such for my future. My host brother is currently on exchange in North Carolina, so I haven’t met him, but his room is very nice. My host parents have this beautiful big home; my room has stairs!! Besides my family, my friends are amazing, and I hang out with them almost every weekend and sometimes after school which is great. Last week was Thanksgiving and a bunch of exchange students and their families met for dinner which was very nice. then there was the ‘festa del torrone’ which was a festival of nougat where I met many new students from other districts in northern Italy and ate amazing nougat. The food here is still incredible, just like my life here and I’m so happy!!!!! Officers Elected and Harry Chapin! The 2019-2020 officers have been elected. We thank everyone for stepping up to fill a leadership role. Our President will be James Williams, President ,Elect will be Darcy Hanley, Vice President is Alyson Burch, Secretary is Carol Knutson, Treasurer is Alice Rose and Sergeant-At-Arms is John Tiller. Thank you for your service. We also had the opportunity to welcome our students of the month: Michael Marciane, Nahama Anitone and Ashanti Geffard from Charlotte High School. These young students were an assest to our meeting. Finally, a few inspiritional words from the director of the Harry Chapin Food Bank, Richard Leber. Since 1984 there have been 24.1 millions pounds of food delivered, they service 5 SWFL counties, they have mobile pantries, school pantries and pantries for senior citzens. $1.00 = $8.00 worth pof food. Currently they are trying to purchase another refrigerated truck. Remember Kids Christmas party Dec 13th, annual Christmas Party, Dec 20th at Isles Yacht Club and no meeting on the 20th or 27th. Happy Holidays! We welcomed Betty Staugler from the Univeristy of Florida to speak about fisheries, coastal environment and microplastics. It seems that the microplastics never degrade but rather become a part of of our environment. That means in our water, our consumable products, fiber from our clothes and eaten by marine life and consumed by humans. Progress is being made to limit plastics but so much more need to be done. You can go to www.plasticaware.org to make a pledge to limit your plastic consumption. They support the Last Straw Campaign. Reminder next week is our Testimonial dinner so there is no noon meeting. Thanksgiving follows that with no meeting. Our next meeting will ne November 29th at noon. Happy Thanksgiving! It was a great day for rotarians as they packed over 20,000 meals for hurricane victims. Thanks to all involved...includong our exchange students! Peace River, Paul Harris, New Members! Wow! Congratulations to Paul Blaine, Paul Harris plus 3! Thank you! We welcomed new members into our club. Welcome Kim Lee and Kevin Knight. 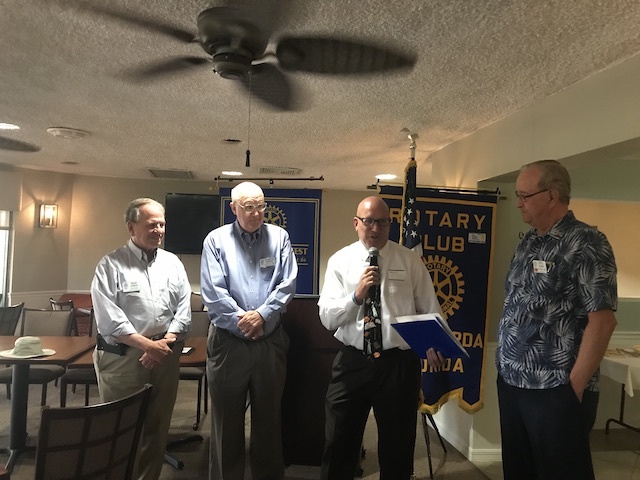 We are pleased they will part of Punta Gorda Rotary! Please do not forget to pay for the Testimonial Dinner honoring John Davidson. This dinner has been a tradition for 27 years! The Peace River Wildlife gave an amazing presentation on the hard word work being done by volunteers to care for animals, reptiles and birds and return them to the wild. Brad Gamblin prsented them with a $10,000 donation to their capital campaign. Extra acknowledgement to George Miller, and Charles Marlowe for their personal donation and to the Punta Gorda Rotary Foundation. Amazing! Exciting meeting if you missed it! If you missed this meeting, let me catch you up! Congratulations to Holly Blainefor Paul Harris Plus 2 accepting Paul Blaine! Thank you! We welcomed a transfer member from the Venice Club, Ken Culbert. Glad to have you join us! We had celebrities attending as well. John Davidson, Testimonial Award recipiant, Alina Bosshard, exchange student, with her host family Cindy and Randy Francis and our own S4TL student Jen Lina and her Pat. Charles Marsee welcomed Pat Ortega to the meeting. Pat joined us with the Stduent of Month, Katrina Smith. Whew! Lots going on. Jen gave our members some insight into her experience at S4TL this year. Jen was so excited about being a part of this. Alina told us about how she has been doing since she arrived in the US from Switzerland. Football games, homecoming and trying out for softball seem to be her life now. Next week George Milller will honor the Peace River Wildlife and the birds will be here! Our club was pleased to introduce our presenter, Leslie Martin, from Jesus Loves You Ministry. This non profit organization provides direct mobile support for the homeless in Charlotte County. They go into the woods and insure the homeless are safe, have the ability to get food, and have the necessary clothing. In addition their facility allows for the homeless to take showers once a week, to get clean clothes and if needed get ready for a job interview. They are alsways in need of food items, clothes, etc. Visit their website at www.JesusLovesYouMinistryInc.com for additional information or to make a donation. President Brad Gamblin had the honor of recognizing James Williams and George Weaver as Paul Harris Fellows plus 3. Thank you! Craig Esterly provided an update on the grants that been approved to date: $1,000 to Crossroads, $3450 for Water4Life to drill half a well. $500 to The Last Straw campaign, and $1000 to Meals of Hope. Thanks to the Rotary Foundation. James Williams provided an update for the TOPG. The music has been reserved and will be performing. The Charlotte High School Jazz Band, The BoogieMen and the Florida Mountain Man. Currently there are 24 vendors signed up and have several sponsors and the top tier levels. Visit the website www.tasteofpuntagorda.org for all updated information, to purchase tickets and become a sponsor. REMINDER: pack meals on Nov. 3 from 8-12 at the cultural center. Kim provided a detailed message about the How and Why it will be important to vote on November 6th FOR the Tax referendum. She explained that this item the last on the ballot. She encouraged members to go to the last page of their ballot so you don't miss it. The picture looks bright for Charlotte County Schools. The 2018 graduation rate is 81%. The school ranking has gone from 48th to 28th. The students are career ready when they graduate. 58% of the students who take AP exams pass and receive college credit. Kim went on to explain how schools are funded in the state of Florida. The state appropriations are primarily used for fixed costs (salaries, operations, utilities). While these costs have risen the state allocations have not increased. A new hire teacher in Charlotte County schools will be paid 38K. Veteran teachers will be retiring and the schools will lose all of that knowledge of HOW to teach. While the state allocation decreased the district made severe cuts to the budget. No more cuts can be made, students already pay 100% of the extracurricular costs. The tax increase would provide a 2 million reserve, lengthen school day, and provide quality teachers. Thank you Kim for good information to make an informed decision. Help your schools, help yourself. 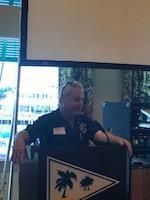 Punta Gorda Rotary Club returned to their home at the Isles Yacht Club for this week's meeting. The remodel is beautiful, so attend a meeting just to see all the great changes. We were pleased to recognize Doug Morey who received the Paul Harris award for the 8th year in a row! 8th year! The report from Jim Sanders via Alison about the Testimonial Dinner was save the date, November 15th, 5:30PM at the Isles Yacht Club. Invitationas will be mailed soon. Cost is $85.00pp. It was the fall General Assembly report time. Brad welcomed comments from all of the directors and board members. It was a pleasure to welcome James Parrish to our weekly meeting! He explained that the Punta Gorda Airport has about 80 employees and is run by a board. There are 3 runways with 220 daily flights. There are coporate hangers and and industrial park which creates revenue. The airport hires over 500 people which is includes ground crew, and operations. For the last 3 years PGD has received the Outstanding commercial airport of the year. Thank you James. We also want to thank Hurricane Charley's for their outstanding service for that last two servers were amazing! Remember we resume meetings again at Isles Yacht Club at noon on September 20th. The meeting this week was a busy one! First, we welcomed Lt. Dylan J. Renz, Punta Gorda Community Services Supervisor, who presented President Brad Gamblin with a plaque thanking our club for the their sponsorship of a team in the Jammer's Basketball league. The team name was Punta Gorda Rotary Fury and they had a great season! 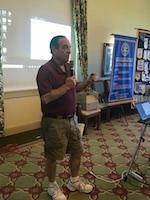 Then our very own past President, Chuck Marlowe gave us an overview and insight in the Rotary International Convention that was held last June in Torronto. Chuck spoke to the tag line Be the Inspriration! He could not say enough about the people, the programs and a great host city. The 2019 Convention will be held in Hamburg, Germany! The 2020 Convention will be in Hawaii! Make your plans. Two Documents you will NEED! An informative session with Jill McCrory, Esq. Jill provided information about creating two very important documents. One is a combination of Living Will and Designation Health Care Surrogate. Ths Health care surrogate allows them to act on your behalf to make medical decisons. Might be good to name 2. The Living Will is written instructions that explain your wishes regarding end of life decisions. The second document is the Durable Power of Attorney. This allows your designee to pay bills, access your bank account and file with Medicaid on your behalf. Thank you Jill. To achieve a stable and enriched learning environment, to provide “tools” to each boy so they can survive in the world, and to teach each boy what society expects from them and what they should expect from themselves, along with learning to love who they are. We are their family and Crossroads Hope Academy is their home. We support that pledge. Please support the PG Rotary Foundation which supports youth, education and service. The Testimonial dinner is held on November 15, 2018. Over the next everal weeks watch the website for conversations with John Davidson. And mark your calendars. 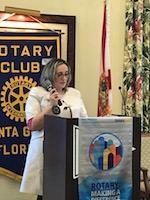 We were pleased to have Chrisanna Harrington from Nutegra Mental Health and Nutrition present to the Rotary Club of Punta Gorda. Chrisanna provided an overview on the latest reserch available about nutrition and Type II diabetes. Her private practice is located in Punta Gorda. She emphaszied that Type II diabetes is preventable through good nutrition, excercise and developing good eating habits. Chrisanna said that 95% of people who diet eventually gain the weight back. Important information! The Rotary Club also had the pleasure of providing a $250.00 to Water4Life from the Giving Challenge! We are pleased to be a part of this project! Rotary was pleased to welcome Aggie Aguila, interim executive director, of the Animal Welfare League to our meetimg. She shared that they have taken care of over 4,000 animals and use over 30 volunteers per day. They take all domesticated animals that are dogs, cats or rabbits. There is a vet in house with other vets available when necessary. As a non profit, they use donations and findraising to sustain. Donations are always welcome even items like office supplies, cleaning supplies and household items. Thank you Aggie for sharing the important work that the Animal Welfare League does. 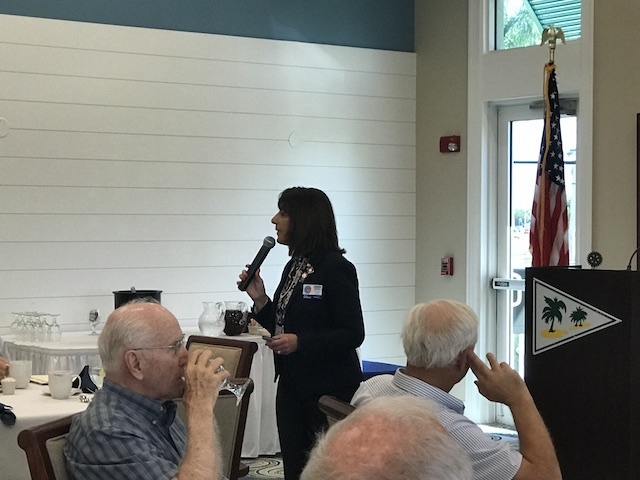 The rotarians this week were treated to a presenation from Katie Mazzi, President of Friends of the Punta Gorda Library. Katie provided an historic persepective about the library going back as far as 1967. The library moved to its present location in 1974 and will be reloacted again once the new facility is completed. The new facility has been a labor of love with the city and county working collabortively to make this happen. Please go to their website www.friendspg.org if you are interested in getting invloved or becoming a business patron of the library. Thank you Katie for your time and this wonderful presenation. See you in the library. Our first summer meeting at Hurricane Charley's was well attended. We had the pleasure of our guest speaker JaHa Cummings, Punta Gorda Council member, speaking about the renamed Sunrise Park off of Edgewater and the new Sunseeker Resort. He talked about the positive changes that could come to our community and the need to change the zoning laws. He also indicated challenges of parking, the need for more retail in downtown and maybe even water taxis. Our club welcomed Bob White as speaker today. Bob explained the history of the Chamber of Commerce as an organization. Charlotte County Chamber of Commerce is actually almost 93 years old! Bob described the ember benefits which are: networking opportunities, mailing lists, display of your business cards and brchures, business expo in February, and the Leadership Program that takes 25 applicants per year! Thank you Bob for your time today. Club News - Great Info! Here us to makimg sure you are caught up on all of the news! We want to welcome our new member Tom O'Brien! Lets get him involved! Congratulations to Arnie and Water4Life Mozambique. The club donated $3500 to dig a new well. Go Arnie Go! For some more good news, Club President Brad Gamblin, gave the final number for the Giving Challenge which is $8926! Way to go! The meeting location for the next 2 months will be at Hurricane Charley's (that is the old Best Western on Retta Esplanade!) . Of course we are keeping Velma's family in our thoughts. Her memorial is planned for this Saturday at 11AM at 4200 Juniper St Port Charlotte. Our club has donated $250.00 to Rotary International in her honor. Finally Charles Marsee was recognized for his contribution for our Youth Services program. Congrats Charles! Attorney Pam Keller provided information about the Florida Guardianship Association. She explained the reasoning and resources available when seeking guardianship. Pam gave insight it what may be a very difficult decision about elder care as well as the advocacy and protection of disabled adults. Thank you Pam! We had the pleasure of visiting the Charlotte County Emergency Operations Center for the meeting this week! What an amazing facility with the capabaility to operationaly handle all types of disasters with a real focus on hurricanes. The facility provides the hub for all emergency services, 911, law enforcement and the media. Thank you Brad Gamblin for arranging the trip and for the yummy lucnch provided by Publix! Thank you Jason. The meeting next week will be held at the Isles Yacht Club! Isles Yacht Club and the Punta Gorda Rotary hosted the annual Change of Watch Dinner on June 14. We welcomed District Governor Elect Rick Kirschner and his wife. We enjoyed the company and extended kudos to those memnbers who were given awards. Congratulations to Arnie Eastburn, Humanitarian of the Year Award, Robin Adair, Membership Award, Donna Calderon, Community Service, James Williams, Presidential Award, Brad Gamblin, Giving Challenge, and Darcy Hanley Spirit if Service Award. Finally, a very special and heartfelt thank you to Chuck Marlowe serving as President this past year! Well done! Punta Gorda Rotary Officers for 2018-2019 are President Brad Gamblin, President Elect, James Williams, Vice President, Darcy Hanley, Past President, Chuck Marlowe, Secretary Carol Knutson, Treasurer, Alice Rose. Dr. Lupina, from Fyzical was the guest speaker at Thursdays meeting. He is a former Interact student and received a Rotary scholarship! Dr. Lupina provided imformation on preventing falls, techniques used in physical therapy, and how to do a self risk fall asessment. Stay safe! Punta Gorda Rotary had a banner meeting. We welcomed Walt Powers who awarded to President Chuck Marlowe the Governors Award with Distinction. Along with that recognition, Charles Marsee gave to President Marlowe the Zone 34 Interact Award. It is because of the outstandng committment from the members of this rotary club that these honors have been awarded. Kudos to all! Darcy Woods presented the amazing work that is being done at the Charlotte County Homeless Coalition. The HC presides over 62 residents, provides 3 meals per day, and works with 420 volunteers. The popuation ranges from single parents, veterans, and families. 25% of the food pantry guests are seniors. In one year they receive over 9500 calls for asssitance, medical services for 105 patients, 86 adults graduated from the "getting ahead program" and 1,358,310 is donated in food, clothing and household goods! Amazing work. Thank you Darcy for your sharing! 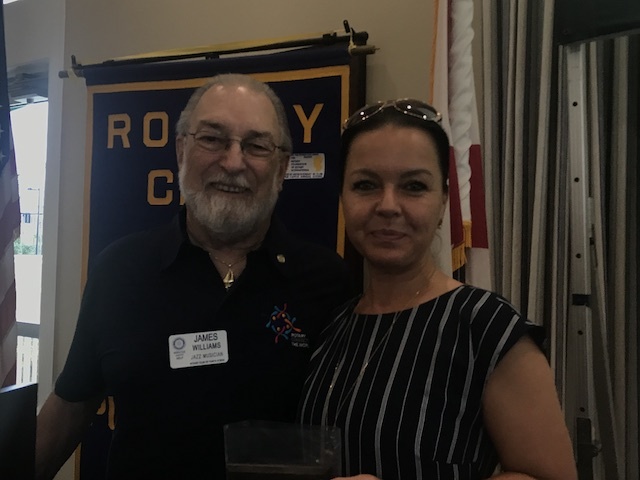 Punta Gorda Rotary Welcomes New Member! Jason Green was inducted in the club at our regular meeting on May 17th. Jason is the manager at the Burnt Store Publix. We welocme into the club and know he will quickly become a contributor to all of PG Rotary events! Vice Preseident, James Williams presents Jason his certificate and pin. The club welcomed our member Duke Rateau as he presented his journey from Haiti to Boston when he was 18. Duke told a compelling story of the history of the island dating back to the Spanish. He spoke of the 14.9 billion in aid that has been given to the island and none of it has reached the people. Only the government and the elite have benefited. 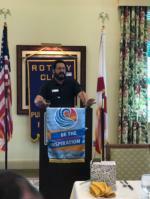 He challenged the Punta Gorda Rotary to get involved and create a knowledge reveloution. Partnering with on line universities to get education to over 1000 students. It was a painful reminder that the world has many many challenges. Rotarians can make a difference! Welcome Students and New Members! We were pleased to welcome our Students of the Month, Taylor Morris and Molly Bitner. They were in attendance with their families. We also welcomed Dave Rogers into the club. It is nice to add to our membership and look forward to getting Dave involved. The Rotary Foundation wants to remind members that May is the month to give to the Rotary Foundation! Thanks in advance. By the Way Dave Rogers pulled the Queen of Hearts! 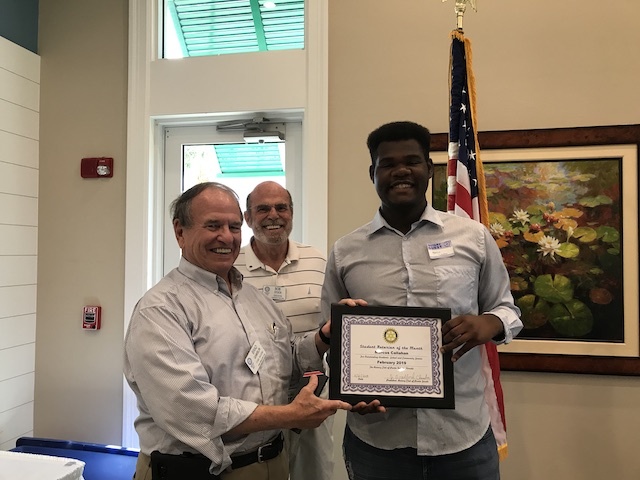 Punta Gorda Rotary awarded the students of Charlotte HS Interact Club with a check for $500.00 James Williams, Chair for the 2019 Taste of Punat Gorda expressed hus gratefulness to the stduents who came an volunteered during the day long Taste of Punta Gorda. Accepting the donation were Co-Presidents Matt Beck and Nick Giordano and Interact Advisor Dave Riley. The Charlotte HS Interact Club invloves over 40 students and will sending an exchnage student Aryn Francis to Italy for her Sophmore year. Punta Gorda Rotary had the pleasure of listening to 3 students from Charlotte HS Interact Club share their experince at RYLA! They described the experience as "amazing" and how they connected easily to people. The presentation was given by Aryn Francis, Emma Giordano and Nick Giordano. They thanked the club for sponsoring them to go and felt honored by the experience. Paul Blaine did share with members that our exchange student will be Alina Bosshard from Zug, Switzerland. While our very own Aryn Francis will be traveling to Italy in the fall. Aryn has already connected with Alina. He also explained there were two students from last year that went to RYLA as counselors. Charlotte HS Interact Club donated $1,000 to Water4Life Mozambique. A new well serves a village of 1200 people with clean water. Previous water supply was carried for miles weighimg over 40 lbs that provides the same villlage water for drinking, cooking and bathing. Now this village has access to clean water 24 hours a day. Charlotte HS Advisor Dave Riley and co Presidents Matt Beck and Joe Giordano presented Arnie Eastburn, Chuck Marlowe, President, Paul Blaine, Youth Services Advsior and Walt Powers Assistant District Governor the check. Interact students provided a short ceremony in apprection for the work Water4Life Mozambique is doing. Our club welcomed John Wright, executive director, of the Punta Gorda Chamber of Commerce to our weekly meeting. John decribed the role of the chamber in our community. The are 3 chamber of commerce clubs in Charlotte County. The Punta Gorda Chamber has 1400 members many are small business owners or individual members! The past year the chamber had a 1.3 million dollar impact on our community. The future goal is to have growth with control. Thamk you John for your time and great shared information. Our club supports two of its members by donating to their charities. Frank Bell received a $250.00 check for Over The Edge! Robin Adair received a $500.00 check for St Vincent DePaul. A special thank you to these members who continue to give! Also, a reminder that May 1 at noon until noon on May 2 is the Giving donation of matching funds. Rex has once again opened his offices to provide a place where we can make our donations. This will start at 5PM. Mark your calendars and plan to be there. Charles and Brooke explained to the club about S4TL. Service 4 Tomorrows Leaders takes place this year in Lakeland, FL from June 17-23. Our club will be sending 2 students to the conference this year! The conference is comprised of 3 districts (6890,6950 and 6960). Attending are 160 delegates. Brooke was a delegate last year. She reported on how much she learned and uses today in her daily life. The conference can use voluteers from our club to assist with transportation and Rap Sessions. Please see Charles for details. 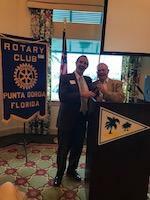 Alan Hitchcock was inducted into the Punta Gorda Rotary Club on Thursday, March 22. Alan hails from Maine and makes his seasonal residence here in Punt Gorda! Welcome Alan! The Rotary Club of Punta Gorda had the distinct pleasure of hearing the life story of Ita Neymotin. She immigrated to the US when she was 6 years old from Russia. Her family was labeled a refusnik and spent years waiting to be allowed to leave Russia. They came to the US with what was on their backs, wearing 3 layers of coats and clothes and allowed one suitcase. It was a true and inspiring story of the magic that happens when you believe strongly in what you are doing. She graduated from The Ohio State University with a law degree. Currently she supervises 130 lawyers as appointed by Governor Scott to the Regional Counsel for the Office of Criminal Conflict and Civil Regional Counsel for Florida's Second District Court of Appeal. Thnk you Ita for your story and inspirition. It was a pleasure to have Charlotte County Sheriff, Bill Prummell at our Thursday meeting. Sheriff Prummell spoke about the services he oversees in the county. He explained that each county differs in the oversight they provide. For Sheriff Prummell he oversees the 911 center, county jail and communication. He was proud to annouce that crime was down 17% last year in the county. Sheriff Prummell shared that the department is preparing for growth that is coming into Punta Gorda. Thamk you for your service. Rex Koch, member Rotarian, provided an insight into the world of a CPA. Rex has an office in Punta Gorda for over 25 years! His office is dog friendly and his CPA advice is rock steady! Rex shared humand experinces of live customers who has he helped over the years. He stated the CPA world is so interesting since you deal with number facts! Thank you Rex for your commitment over the years to your profession and Rotary! ANNOUNCEMENTS!!! CONGRATULATIONS TO JIM SANDERS! Highest home buyer ratings in North America!!! BRING A BOTTLE TO THE NEXT MEETING! We welcomed Don Musilli from Englewood Incubation Center who talked about the technolgies around 3D printing. Don explained the 3D printing process as it pertains to buildng homes in addition to printing all types of materials. Don is invloved with 42 schools, libraries, and youth clubs with the 3D technology. Don explained the critical need for adforable housing and that 3D printing may be that solution. Extrememly interesting topic! Welcome to 2 new rotarians into the Punta Gorda Rotary Club. Welcome Ann Mallen who comes to us from California. Ann resides in Punta Gorda and is a retired nurse. Our newest member is Duke Rateau, orginally from Haiti, then Boston and finally here is SWFL. We are very glad to have you as part of our membership. Now be sure you have volunteered for the Taste of Punta Gorda! Welcome to Chief Pam Davis, Punta Gorda Police Chief! REMINDER: VOLUNTEER FOR TASTE OF PUNTA GORDA, BRING A BOTTLE FOR SILENT AUCTION, BRING COOLERS TO THE TOPG! 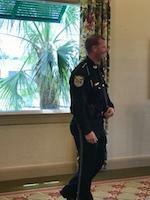 Chief Davis was welcomed by the Punta Gorda Rotray Club. Chief Davis came to our comunity via Baltimore, Maryland with extensive experience in law enforcement. She has had experince with property crime, sexual offenders, police think tanks and police administration. She expressed her desire to allow her police officers to resolve sitiations they may face in the field as well as enhance the Citzens Advisory Council. She provided an overview of her community policing philiosphy. Thank you for all that you and your officers do! It seems that all you have to say to this rotary club, where, when and how and our volunteers are right there. Habitat for Humanity and Punta Gorda rotary team up to paint houses in need in our community. The paint, supplies and manpower are all provided by volunteers! The event always happens the first weekend in February! Once again, a huge success! Here is the latest in club information! Mike Colgin from Charlotte Harbor Club presented the annual information about the Pub Crawl (which is sold out) however there is a raffle to be given away and proceeds go to the Harry Chapin Food Bank. If you need/want a 10.00 ticket, see Robin and he will hook you up! The raffle prize is a trip to Las Vegas!!! In other club news, the Paint your Heart Out is this weekend. There is still a need for volunteers for the Taste of Punta Gorda. Contact James Williams. Flyers for this event have been made and can be obtained by contcating James or myself and we can send them to you. The silent auction is requesting a donated bottle of wine or spirits. Please bring to the next meeting. Paul Lioon was the guest speaker. He explained his background and the services he provides as it pertains to estate planning. Paul provided insightful information about how to plan, what to plan for and resources available for your end of life decisions. Ask Paul if you have additonal questions. It is always a pleasure to have rotarians visit our meetings from other clubs. We had the pleasure of having Sue Slater visiting from Butler PA. and out guest speaker Len Warrington from Oakville Canada. Len explained how their club over the last 60 years have managed housing for senior citzens. Not only managing, but repairs as well. Over they years their club had bought and sold several senior housing complexes which a direct benefit to their foundation. It was a unique story about how a rotary club provided a need and a service to the senior community. Thanks Len. A reminder that the Taste of Punta Gorda is quickly approaching. Members need to complete their volunteer form. As part of the silent auction, each member is asked to donate a bottle of wine or spirits. Please bring to the next meeting. Paint Your Heart Out is next weekend.....see Robin if you need information. Wishing all our members a Happy New Year! Chcuk Marlowe congratulated Paul Lioon as a Paul Harris Fellow times 2. Thank you Paul for your continued outstanding suport. Barry S. presented a flag from his home club in Plymouth, Michigan. The club also had the honor of inducting Ann Mallen as a new member! Welcome Ann! A special thank you to club member Ralph Bush for his presentation today at the meeting. Just some date reminders: Paint Your Heart Out is being held Feb 3. See Robin so you can volunteer! The Taste of Punta Gorda is on March 11. May the Taste Be With You! See Ernie if you have questions or want to assist with the silent auction. 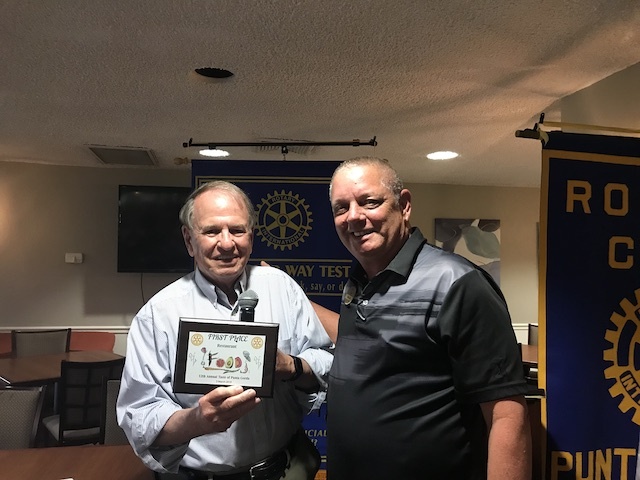 The Punta Gorda Rotary welcomed new member Terry Molitor as a new rotarian. Terry had been a member in Michigan and continued to follow his family into Rotary. Terry made it complete with rotarian Laura Knutson and Carol Knutson. Thank you Robin Adair for you help! 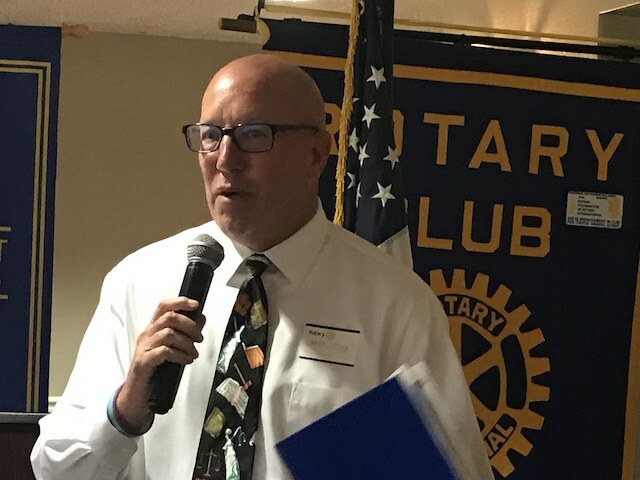 Punta Gorda Rotary had the distinct pleasure of of guest speaker Mike Mansfield about Habitat for Humanity. The slogan Hand up not a Hand out was emphasized giving credit to the business partners, and sweat equity from owners makes this a unique orgnaization. Mike explained that the uniqueness of Habitat is the education that is provided to homeowners. They also receive HUD financial literacy courses. The Punta Gorda Rotary is the major sponsor in this years Paint Your Heart Out held in February. The Punta Rotary Club welcomes back Jerry O'Halloran. Jerry will not miss a beat and the club is hinored to have his return. 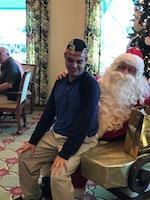 Merry Christmas Rotary with Santa! 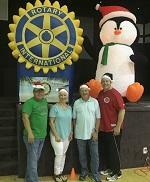 Punta Gorda Rotary welcomed students from the Charlotte Harbor School for a Merry Christmas party including Santa. Staff members Jackie Trombley, Pat Alese, Beverly Butcher and Brandon Knarr joined the festivities. The annual event is orgnaized by Rotarian Donna Calderon and her husband. Lots of holiday cheer! Students opened their gifts and lots of amiles to go around! Punta Gorda Rotary Stepping up! 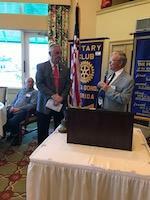 Punta Gorda Rotary extended a hand to the Lemon Bay Sunrise Rotary club. Several of our club members helped pack meals for the homeless and those in need of meals! Extending that good holiday feeling! President Chuck Marlowe graciously accepted flags from other Rotary Clubs. Paul Blaine visited Clackamas Rotary Club in Orgeon and Geroge Miller shared his flag from Gray Lake. Arnie Eastburn, accepted the flags on behalf of the Punta Gorda Rotary Club. Charlotte High School students of the month were introduced today by Bob Stock. We were pleased to recognize John Tietsworth and Celine Wodka to the meeting today. They were accompanied by their parents and the principal of the high school. Charles Marsee graciously annouced that the daughter of Randy Francis has been accepted as a Rotray Exchnge student for next year. Imagine going away from home, to a strange school in another country for your Junior year of High School. Nicole Berg provided insight into her year abroad. She learned the language of Finland, traveled to other countries, sat with her new friends in coffee shops and attened over 37 museums in Helsinki. Her presentation was a delightful account of your journey as an exchnage student. 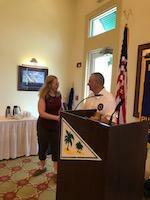 Punta Gorda Rotary wishes Nicole Berg continued success. The Punta Gorda Rotary Club annually donates their time for one weekend in October to provide volunteer hours working the airshow. The club today received a donation for their hard work. Once again showing Rotary's committment to our community. Thank you to all those invloved. We look forward to next year! WHOA! THE MEETING TODAY WAS AWESOME!!!! Just taking a little time to recognize the amazing efforts and committment by the Punta Gorda Rotary. We had the distinct honor of having the Executive Director of the Punta Gorda Education Foundation, Sarah Wierhake at the meeting today. It is one of the many projects that the Punta Gorda Rotary Foundation supports. Another PG Foundation project is Water4Life, headed up by Arne Eastburn. Arne had just returned from Mozambique, specifically Namirina Village after digging another well. Fresh water for over 800 people who would otherwise walk 6 miles to get dirty water. Thank you Arne! It is also notable that Rotary President, Chuck Marlowe recognized James Williams as a Paul Harris Fellow. Thank you James! Finally, we are supporting Josh the Otter, a water safety program for young children. Rotarians will be sharing this program in several schools. Yikes! This club is amazing. Check the calendar for upcoming dates! Third grade students attending Charlotte Publi Schools Receive Dictionaries! It is an annual event that has been going on for a long time. Punta Gorda Rotarians visit classrooms of third grade students in Charlotte Public Schools to provide them their own personal copy of a dictionary. In a classroom this year the teacher went over to the bookshelf and pulled her personal copy off the shelf. This was given to her when she was in third grade!! Just another example of Service above Self! thanks to the generosity of the Punta Gorda Rotarians. 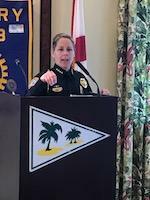 The Punta Gorda Rotary welcomed our guest speaker Lori Burke. Lori Burke is the Program Director for Mothers Against Drunk Driving out of Ft Myers. Lori spoke to the group about the impact this orgnaization has had on the awareness of no driving under the influence of a substance and or alcohol. She shared that in the past few years the increase of DUI's has been noticable however the use of UBER has created a positive outcome. Archway Institue presenter Dan Stuckey, provides information about recovery from the disease of addiction. Dan and Jan Stuckey provided an overview of the Archway Institute whose mission is to assist indivduals suffering with addictive diseases and co-existing mental health issues by providing financial assistance for treatment. Dan told the poignant story of his son and the path of addiction and recovery he traveled. The institute offers hope to families seeking support for recovery. Each month the Punta Gorda Rotary honors students. PG Rotary recognizes students each month during the school year. Students are invited to the meeting along with their parents. Students provide insight on their activities they particpate in. We are pleased to recognize these students, McKenzie Robbins and Elizabeth Sloan. Don Thomas spoke to Rotary members about The Gift of Life program. The program has treated over 27,600 children from 78 countries and provides lifesaving care to more than 1500 chlidren per year. Thank you Don for providing our club with an overview of the this wonderful program. Rotarians gave a $2000 donation to the Harry Chapin Food Bank. This was in direct reposnse for those in our community who need help after hurricane Irma. We want to ensure that our neighbors in need receive as much food and support as we can possibly provide. The food bank can turn every dollar donated into $8 worth of food value. We need to raise $500,000 by Nov. 1 through the Recover, Rebuild, Restore campaign. Dargon Boat Races on October 28th! Get signed up, grab and paddle! PUNTA GORDA ROTARY DOING A FUN FILLED COMMUNITY SERVICE WEEKEND! This weekend the Punta Gorda Rotary took community service to the next level! Many members helped at the air show and worked taking tickets under the tent both Staurday and Sunday! Rotarians stepped up and helped their community throughout the weekend. While that was happening the International Coastal Cleanup was held early Saturday morning. Rotarians picked up trash, bagged and tagged it making Brown Park look great again! Thanks to everyone invloved making a difference that is what our Punta Gorda Rotary members do! REMINDER! Dragon Boat Races October 28! Our club has pledged to help those who have been impacted by hurricanes Irma and Maria. The Foundation has set aside $10,000 in donation matching funds for Irma and Maria relief efforts. The public can make their donations on our Facebook page. All Rotarians are encouraged to donate and can earmark funds for those impacted by Irma and/or Maria. A group just this week went to Bonita Springs, under the direction of the local Bonita Springs club and took a trailer full of supplies. They stayed and worked. Please watch the website and Facebook for any additional information. Help is Needed Again, Again and Again! The Punta Gorda Rotary is stepping up and stepping out to help those in Bonoita Springs and beyond. How can you help? www.signupgenius.com/go/5080d4bafad23a7fa7-rotary. You can sign up with your time and sweat! So appreciated. 2. Donate your money either on our Facebook page https://www.facebook.com/puntagordarotary/ or send a check to Rotary Club of Punta Gorda, P.O. Box 511132, Punta Gorda, FL 33951-1132. September 28, 2017 (Punta Gorda, FL) – With Rotarian David Smith on point and in charge, members of the Rotary Club of Punta Gorda arrived at the Walmart parking lot Monday afternoon to fill Smith’s trailer van. They brought relief goods ranging from water and diapers to toilet paper and food stuffs, and loaded up crow bars, a chain saw, and other tools. At 7 AM on Tuesday, a Rotary work team assembled to drive with Smith to Bonita Springs, where they linked up with Disaster Aid USA (DAUSA) team from Rotary Zone 33 led by Russell Koon of Morgantown, West Virginia (http://www.disasteraidusa.com). The Punta Gorda Rotary work team spent several hours doing mold removal in a house on Pawley Avenue, south of the Imperial River which had flooded hundreds of homes between I-75 and Imperial Parkway to the west and Bonita Beach Road to the south. The task involved removing everything from the property: personal property and furniture, appliances, counters and sinks, doors, wood trim and baseboards, and finally sheetrock and insulation. Then DAUSA sprayed disinfectant throughout the house. Additionally, the team cut up a massive limb from an aged oak tree in the front. 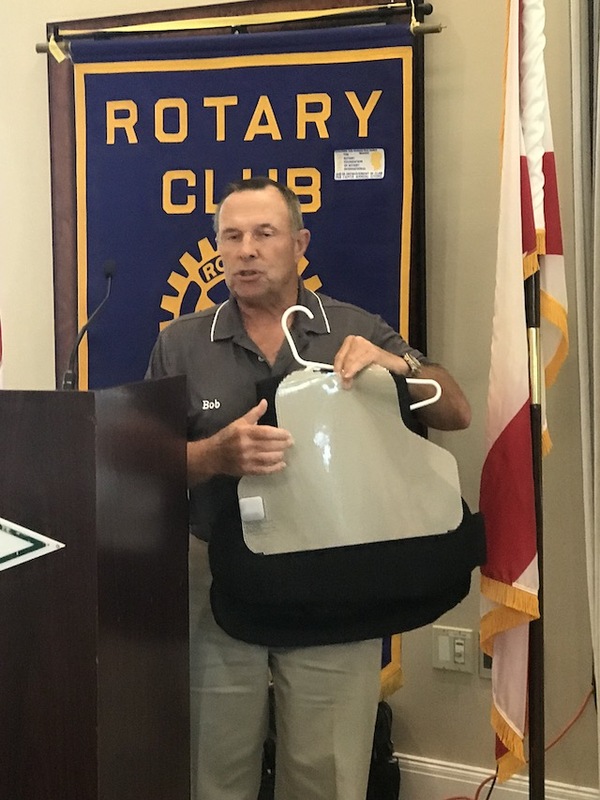 In Bonita Springs, the Rotary Clubs of Southwest Florida (District 6960), led by Rotarians like Jonathon McLeod, president of the Bonita Springs Club, are working with the aid of DAUSA, to help as many of the community’s hurricane victims clean up after Irma. They have daily work crews, and volunteers can sign up to join daily work crews at www.signupgenius.com/go/5080d4bafad23a7fa7-rotary. In addition to boots on the ground, the Punta Gorda Rotary Club’s 501(c)3 nonprofit foundation, a, has set aside up to $10,000 to match funds donated to the Foundation for Irma and Maria relief efforts. Anyone who wants to contribute can do so by writing a check to the “Punta Gorda Rotary Charitable & Education Foundation” and earmarking it for Irma (help in Southwest Florida) or Maria (wider help in Puerto Rico and the Caribbean), or just if one prefers hurricane relief and the Foundation will distribute the gift proportionately. Donations should be mailed to: Rotary Club of Punta Gorda, P.O. Box 511132, Punta Gorda, FL 33951-1132. The Club is also planning a public social event like a wine and cheese tasting to raise additional funds for relief and assistance. The date and location for this event is to be determined. Rotary Club welcomed Fire Chief Ray Briggs and Fire Marshall Jennifer Molnar to this weeks meeting. They shared the many services they provide for residents of Punta Gorda. Oct 8-14 if Fire Prevention Week and the highlighted topic is a Fire Plan. Make sure you have one and everyone in your home is aware of the escape route. We appreciate and thank them for their service! Rotary Meeting Guest Speaker Bob Clendenin. 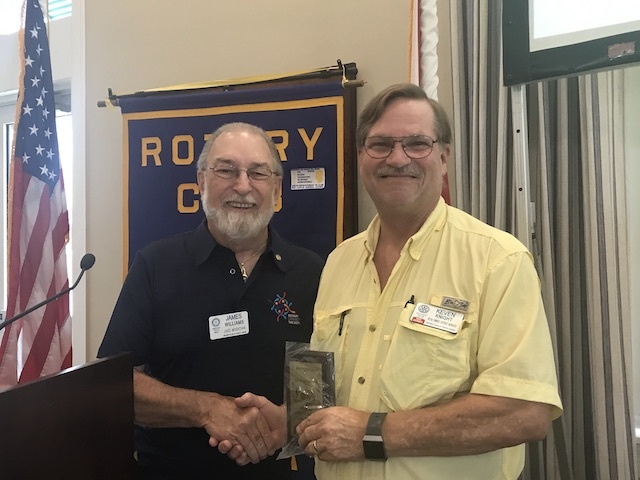 Bob Clendenin was welcomed as the speaker for the August 17th meeting. Bob has been actively involved in Rotary and Rotary leadership since 1985. Bob shared his experiences having attended 16 Rotary International Conventions. His presentation had historical value mixed with a good dose of Bob's humor! The Rotarians had the pleasure of hearing Dr. Gary GoForth talk about the Coins for Alzheimers. Did you know that 100% of the donations in the "blue buckets" go to research? Currently 700 rotary clubs participate and 19 distericts support CART. Research grants are awarded, now over $700,000 are awarded and often lead to much larger grant funding. Our deepest sympathy to the friends and family of Jerry Mears. The Rotary Club of Punta Gorda extends our condolences on the passing of our friend in service, Jerry Mears. Jerry was a longtime member of the Club and an active member of Rotary. The family is planning a memorial service in October. Our deepest condolences and heartfelt sympathies go out to his family during this difficult time. 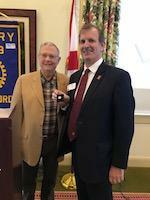 Walt Powers, Assistant District Governor provide the offical Rotary message and is welcomed by President Chuck Marlowe. 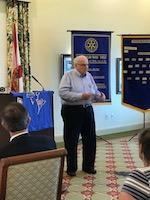 Rotary Club of Punta Gorda had the pleasure of hearing the official message from Assistant District Governor, Walt Powers. The theme is Making a Difference thru clubs, humanitarian service and community awareness. Encouraging clubs to track volunteer hours in service above self. Staying focused over the next 3 years of pledged support of 450 million to END POLIO. Humanitarian service in the following categories of child and maternal health, water and sanitation, peace and conflict resolution, basic education and literacy, disease prevention and economic and community development. Rotary Club of Punta Gorda makes a donation to Water 4 Life. Presenting a check for $6,900 drill a well for Water 4 Life in Mozambique. The well will provide water for 1200 people who would otherwise have none and have to travel for a day to retrieve water for their family. Arnie Eastburn graciously accepted the check. The Water 4 Life project falls under Making a Difference as a humanitarian service. Thank you Rotary Club of Punta Gorda! Left to right Brad Gamblin, Craig Easterly, President Chuck Marlowe, Arnie Easteburn, and Assitant Governor Walt Powers. Rotary Club of Punta Gorda welcomes home exchnage student Nicole Berg! Nicole is home from an exchange student spending a semester in Finland. She spoke to the group in Finnish and her enthusisam showed! We are glad to have her home and look forward to a formal presentation later in the year! Nicole and President Chcuk Marlowe presenting a Rotary banner from Finland. Rotary Club of Punta Gorda donates a well to Water 4 Life for drinking water! July 28, 2017 (Punta Gorda, FL) – The Rotary Club of Punta Gorda’s charitable foundation presented a check for $6,900 to Water4Life Mozambique, a locally-based nonprofit charitable organization founded in 2014 by Arnie Eastburn. The Rotary Club embraced Water4Life Mozambique as a major international project, with the goal of drilling several sustainable water wells to provide clean, safe water to the people in poor villages of Mozambique, Africa. Arnie Eastburn’s passion to provide clean water for Mozambique, one of the poorest and most underdeveloped countries in the world, led his organization, Water4Life Mozambique, to drill wells that now provide 54,000 people with clean, safe water. The impact on the communities has been enormous, relieving women and girls from having to walk up to five miles daily to fetch dirty, contaminated water. This means they can go to school and take on other tasks for the betterment of their villages. 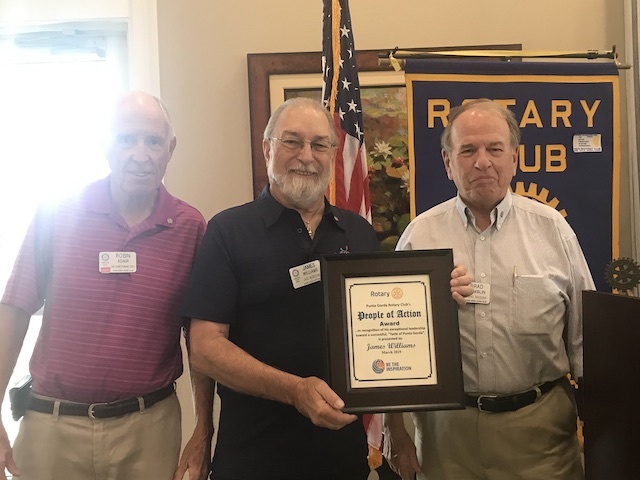 The Rotary Club of Punta Gorda is eager to take a leading role in Rotary Internationals’ next major cause and, through its members and its local foundation, are excited to partner with Water4Life Mozambique and providing $6,900 to drill its next well this Fall. Hugh Mcdowell receives Paul Harris Fellow! 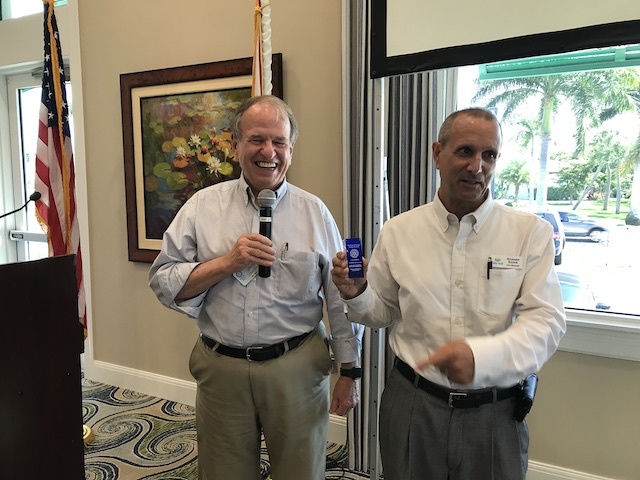 Rotarians in the Punta Gorda Rotary honored Hugh McDowell for providing musical interlude at the meetings for over 13 years. Hugh was honored by receiving the Paul Harris Fellow. Thank you Hugh! Rotary Foundation Chair, Brad Gamblin, thanks Rotary Foundation board members for their service this past year. Brad Gamblin recognized (left to right) Rex Koch, Randy Francis, Frank Bell, Brad Gamblin (chair), John Dzurk and Charles Marlowe. Rex shared with the members that the International Rotary Foundation has existed for 101 years and has raised 4.1 billion dollars. Your conrtribution does matter. A warm welcome for Steve Schuleter, Assistant Regional Foundation Coordinator. Thank you Steve Schuleter who provided insight into the Rotary International Foundation. Steve is currently the Assistant Regional Foundation Corrdinator. Steve is the past District 6960 Governor and the District Major Gifts Chair. Rotary is celebrating 100 years of "doing good". That means in our district alone Rotarians have donated over 1.4 million dollars.